This October, ROI Healthcare Solutions is a proud partner of National Health IT Week, focused on the advancement of health information technology to help improve healthcare. 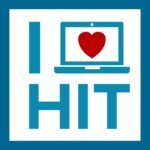 The week consists of events across the country, including National Health IT Week participants — vendors, provider organizations, payers, pharmaceutical/biotech companies, government agencies, industry/professional associations, research foundations, and consumer protection groups — all working together to elevate national attention to the advantages of advancing health IT. View the full list of Health IT Week partners. Working together with our growing coalition of stakeholders, ROI is helping to transform healthcare for all.